Published on January 12, 2015 by Rachelle J. 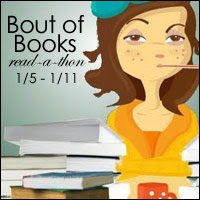 For Bout of Books information, visit the Bout of Books blog. 827. I think I may have figured up my total pages wrong. Either that, or I figured up my daily totals wrong. I don’t know which, and I’m still having some difficulty getting used to the Kindle only showing percentages instead of pages. Regardless, this has been the best Bout of Books for me so far. I got most of the way through Walking the Labyrinth by Lisa Goldstein, despite running errands and doing laundry. 3 books + 89% of another book is really good as far as I’m concerned. At the very least, this Bout of Books allowed me to cut down on my TBR review books and get ahead of schedule. I only participated in 1 mini-challenge, but I also joined in on a twitter chat, which I had never done before. Those are some awesome totals!